The Punjab Government has protested to the Planning Commission for cold- shouldering its demands for allocation of funds from the Central kitty. After holding several meetings with the Planning Commission officials concerned, Punjab officials realised that the eligibility for infrastructure schemes favoured the least developed states. 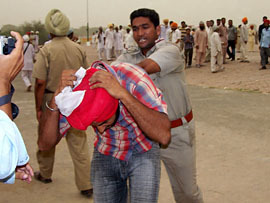 The absconding Baba Amrik Singh, who has been expelled from the dera of Baba Jagtar Singh Kar Seva Wale, Tarn Taran, alleged that the dera chief and his followers inflicted “mental torture” on him for several days in captivity and hatched a conspiracy to “eliminate” him to finish all ‘proofs of embezzlement’, collected by him (Baba Amrik Singh). Keeping in view the constitution of an inquiry into the exchange of firing between the occupants of a Qualis van and Sub-Inspector, Paramjit Singh, Station House Officer, Mahilpur police station of this district, at Dadian village last evening, the latter was transferred today. Shiromani Akali Dal (SAD) Secretary General Sukhdev Singh Dhindsa will head the nine-member committee of the Bharatiya Janata Party (BJP) and the SAD on the seat-sharing arrangement for the Assembly elections. Tragedy struck a family from Chhota Khera village after their two sons drowned in the Sutlej while they, along with three friends, were taking bath there. The bodies of Raj Kumar (22) and Tinku (18) were fished out with the help of divers after two hours. Certain PSEB officers charged with corruption are not only being allowed to go scot-free, but are also being rewarded with plum postings. As per documents available with The Tribune, Mr Rajit Sharma, the then AEE at the Nehru Garden subdivision in Jalandhar, and Mr Darshan Singh, ASE in charge of the east division at Jalandhar, had been found guilty in a technical audit investigation report of the PSEB. Refuting the allegations of the SAD on the Manji Sahib episode, the PPCC President, Mr Shamsher Singh Dullo, today said that it was not the first time that the Akalis had perpetrated sacrilege of Akal Takht and such unruly scenes were often witnessed at their meetings. Senior BJP leader and former Himachal Pradesh Chief Minister Prem Kumar Dhumal yesterday said the SAD-BJP alliance would form the next government in Punjab as its people were fed up with the Congress government due to its failure to control the spiralling prices of essential commodities. 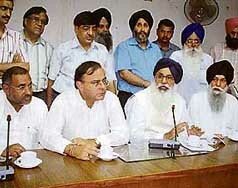 Mr Manjit Singh Calcutta, a senior Akali leader, announced that a Panthic Coordination Committee of Akali Dals would be formed soon to remove Mr Parkash Singh Badal from the presidentship of the Shiromani Akali Dal (SAD). 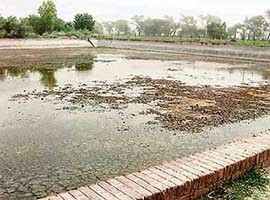 The Punjab Government is preparing a report to assess the extent of pollution of river Sutlej and the Beas caused by discharge toxic sewage and industrial waste. 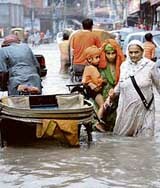 Nearly 6,000 residents of Jandwala Meerasangla village, which was devastated in a squall in January, 2003, are still awaiting the Rs 1-crore special development grant announced by Punjab Chief Minister Amarinder Singh during his address to a rally here five days after the calamity. Constructed at a whopping cost of Rs 12 crore, the Nehru shopping complex on the busy Lawrence Road has also been converted for the parking of impounded vehicles by the police. Eighty-year-old, Mr Sham Sunder of Himachal has been forced to spend life at Sangrur pingalwara as his family of sons, grandsons and a wife, has abandoned him. The first-ever meeting of Finance Ministers of SAARC countries, to be held in Pakistan, will hold discussions on various trade and economic issues, besides generating unanimity on the South Asia Free Trade Association (SAFTA) agreement, which was implemented on July 1. Hundreds of cine-goers had a narrow escape when fire broke out in the Anam cinema hall here at around noon today when Hrithik Roshan-starrer “Krrish” was being screened. Continuing campaign launched in the district against the drug abuse, the Deputy Commissioner, Mr Alok Sekhar, announced to set up drug de-addiction centre for the rehabilitation of drug addicts. Hundred of acres of standing cotton and paddy crops were submerged at Rupana and Dhigana villages following a breach in the Arniwala minor early this morning. Water also entered a Dalit locality at Dhigana village. Farmers Gurtej Singh, Darshan Singh and Balkar Singh alleged that the tragedy occurred due to excess release of water in the minor. The body of Prabhjinder Singh, alias Dimpy, a gangster, who was killed in Chandigarh on Friday night, was consigned to the flames at his native place, Chandbhan village, near here, today. The local Vigilance Bureau today caught an SDO working with the Punjab State Electricity Board accepting illegal gratification from one of his subordinate officers. The police has nabbed a head constable, a constable, a quack and a juice-seller for cheating a person in the name of changing viscera of his son’s body. The police has booked Kala Singh of Kishanpura and his unidentified accomplice allegedly for killing Gurmel Singh of the same locality here yesterday. The issue of setting up a national-level law university here seems to have taken a serious turn as a high-level team of the Bar Council of India, led by Mr Jagan Nath Patnaik, which inspected the infrastructure at the local Mohindra Kothi today, expressed disappointment at and displeasure over inadequate arrangements to run a university. Unemployed B.Ed teachers, who have applied for the 450 vacant posts of teacher in schools in district, today staged a dharna in front of the Zila Parishad office against the delay in releasing the list of the selected candidates.